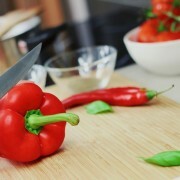 Knives, plates, machines and glassware are essential tools found in restaurants. They are extremely useful, but if mishandled they can be detrimental to your business. Restaurant safety is important and your staff should be trained on how to properly handle sharp and fragile equipment to avoid injuries. Below are tips on how to prevent cuts/lacerations from sharp objects found throughout the restaurant industry. Keep knives sharpened and let other staff know when knives are newly sharpened. Use the appropriate size knife for the job. Always use a cutting board. They prevent objects from slipping while being cut which could lead to injury. Carry knives with the point down and the cutting edge away from your body. Store knives properly in racks or knife sheaths close to areas where they are used. Clean knives immediately after use. At all times, be in control of your knife blade, your body, and the food you are cutting. ALWAYS tell management immediately if machine guards are missing, broken, or not working properly. Avoid mechanical shock by avoiding glass contact with another hard object. Never Carry Glasses close enough where they are rubbing against one another. Only use glassware for serving desserts and drinks. Do not use glassware to store other items or to scoop ice as this could damage the glassware and cause it to break. Never serve beverages in cracked or chipped glassware. Tagrisk Insurance Services’ risk appetite includes but is not limited to restaurants, bars, nightclubs, and lounges. Our hospitality insurance programs fill coverage gaps that may exist in your current policies. Do not renew your insurance without a quote from us. Contact Tagrisk Insurance Services for a quote today! Restaurants are not just judged by how great their food is and how outstanding their customer service is. Ergonomics play a factor in determining if a restaurant is a good spot to eat and a nice place to work. If Starbucks did not have comfortable seating, would it still be the amazing coffee shop it is today? Could restaurant turnover decrease if ergonomic conditions were positive and sustainable? 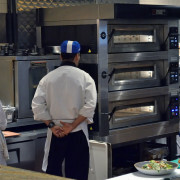 Tagrisk Insurance Servcies is a firm believer in safety in the restaurant industry and ergonomics matters. As a restaurant owner, it is your job to make comfort a priority in your establishment. Solution: Anti fatigue matting provides softer surfaces to relieve stress from standing for long periods of time. Footstools allow employees to shift their body weight from solely their legs and lower back. Problem: Continuous movement of upper body parts such as elbows, wrists, forearms, and upper arms with more than 9 reps a minute. This movement overtime can cause joint pains, musculoskeletal injury, or carpal tunnel syndrome. Solution: Use automated devices when possible. Perform tasks in different working positions to avoid continuous and repetitious movement of the same muscle/muscle groups (e.g. alternating hands). Employees should pace themselves, stretch, take breaks, rotate within the job, and combine/eliminate tasks where possible. Problem: Extreme stress caused by an excess use of force can lead to a variety of injuries. Solution: Good form/posture while performing job duties that require some level of force will allow employees to use less force and reduce risk of injury. Lift all objects that require your employees to bend over, with a straight back and bent knees. Your staff can also see where the load is going and plan accordingly on how to handle. Always look for ways to reduce the weight of what needs to be carried by separating what can be separated. Rather spend 2 extra minutes making 2 trips then have back pains for the rest of your life. Use dollies, conveyors, and hoists when applicable. Pushing something on wheels as opposed to carrying, lifting, and carrying can reduce chances of strains and sprains. Place heavy items at mid-thigh height (not just placing heaviest items on the bottom shelf). Be mindful of floor conditions when carrying items that are wobbly, slippery, or warm. Solution: Add padding to sharp or rugged edges to reduce strain and stress on hands. Make sure employees avoid leaning against metal surfaces of these rough edges. Try to round off sharp edges on shelves, tables, and ledges. Problem: This is a problem that happens when employees must move quickly in a fast-paced setting or when fundamental safety procedures are not set in place. This can lead to a wide variety of injuries. These are just a few ergonomics concerns for restaurants and solutions to some of these problems. Tagrisk Insurance Services’ risk appetite includes but is not limited to restaurants, bars, nightclubs, and lounges. Our hospitality insurance programs fill coverage gaps that may exist in your current policies. Do not renew your insurance without a quote from us. Contact Tagrisk Insurance Services for a quote today! Tagrisk Insurance Services is a world class insurance organization, providing an innovative and creative alternative to today’s conventional industry standards. We lead the industry by sticking to our core values of industry, innovation and integrity. What we have done for the hospitality industry has been nothing short of amazing. We understand 100% of your risks and design insurance solutions that eliminate coverage gaps, and protect you with top hospitality insurance carriers. Our leadership team has over fifty years’ experience providing insurance solutions to nightlife hospitality venues. Our experience specializing in the restaurant, bar and nightclub industries provide a unique perspective to your market. The exclusive relationships our team has formed allows Tagrisk to provide broad based carrier access with programs designed specifically for the unique needs of our clients. Our leadership team is led by none other than our Chief Executive Officer, Thomas A. Golub. Tom has 3 decades of executive leadership and sales management experience. He founded Tagrisk Insurance Services in 2013 after selling Beecher Carlson Holdings Inc. to Brown & Brown Inc in July of 2013. His knowledge of the commercial insurance industry, more specifically the nightlife hospitality industry, is unmatched and is one of the reasons Tagrisk is a powerhouse today. Tom is well respected throughout the hospitality industry and his likeness has aided in building strong relationships with various insurance carriers. Our carrier relationships help us provide and exceptional level of customer service with access to our Risk Management Center and premium financing 5-10% less than the industry standard. http://tagrisk.com/wp-content/uploads/2017/07/Tagrisk-JPG-LOGO1.jpg 252 714 Admin http://tagrisk.com/wp-content/uploads/2017/07/Tagrisk-JPG-LOGO1-300x106.jpg Admin2017-09-05 15:38:302017-09-05 15:45:22Why Tagrisk? ©2018 Tagrisk. All rights reserved. Tagrisk is the registered trademark of Tagrisk, LLC.